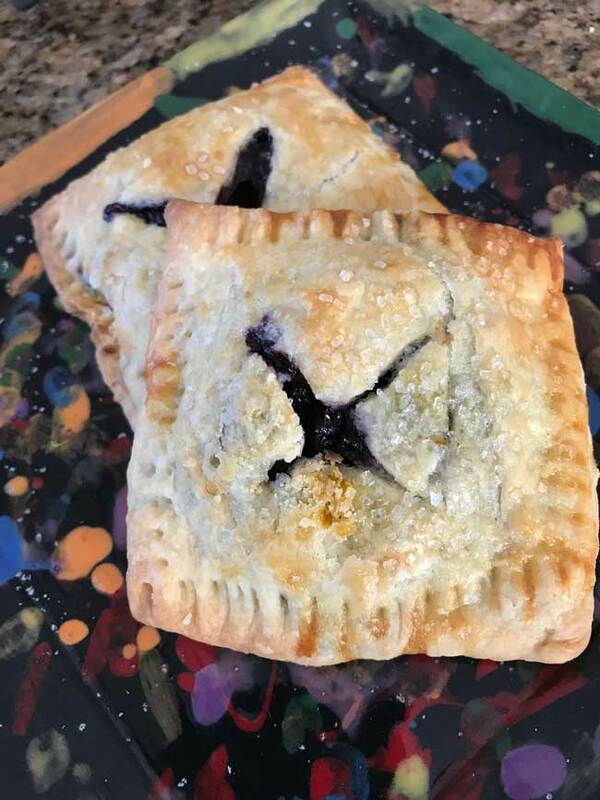 These Blueberry Hand Pies were my reward for cleaning out the freezer. I was rummaging around and a stash of frozen blueberries fell out. 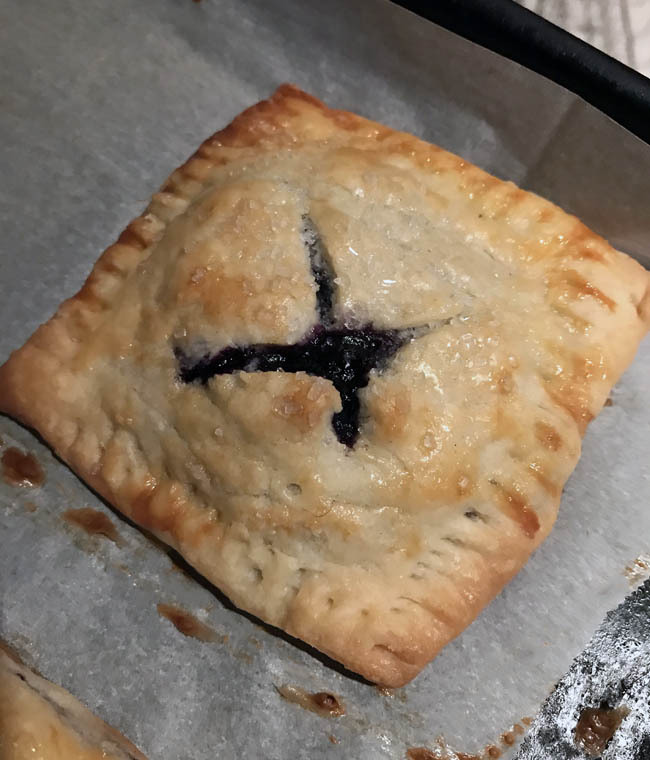 In need of a project (one that was more interesting than cleaning the freezer), King Arthur’s Blueberry Hand Pies were just the ticket. Now I wish I’d made them sooner because there were so many past occasions where I could have taken assorted hand pies to an event. These are good hot or at room temperature and don’t have an overly dough-y flavor or weird crust to filling ratio. Also, the dough is easy to work with when cold. If you are not very skilled in rolling and shaping things, you may want to keep half the dough in the refrigerator and assemble half the pies at a time, but it’s definitely a pleasure to work with. Here’s the recipe from King Arthur. 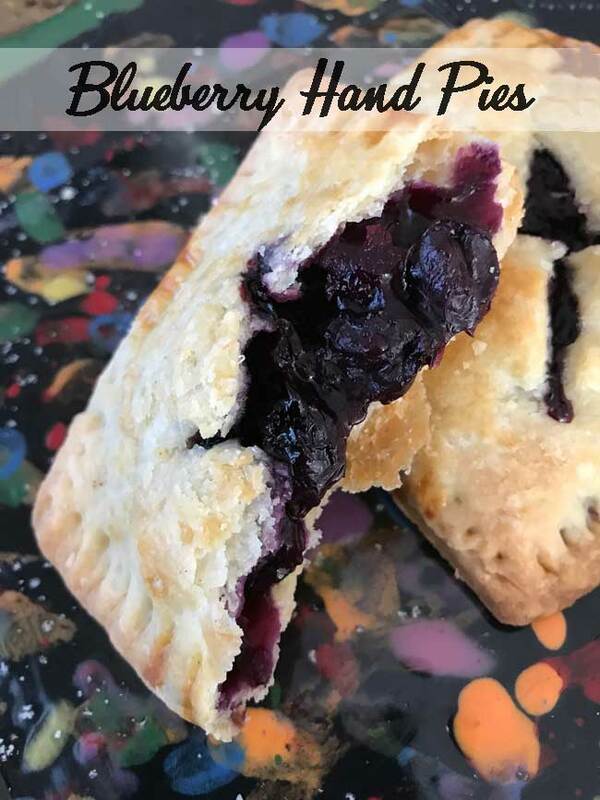 If you like the dough in Blueberry Hand Pies you can make a second batch of dough for Lemon Hand Pies. Notice anything different about the one in the picture below? The pastry is way better. It’s puffier, lighter and flakier due to the fact that for the second batch I followed KA’s direction and made it by hand. For the first batch I used my food processor thinking it wouldn’t matter if I carefully let the food processor do the job. 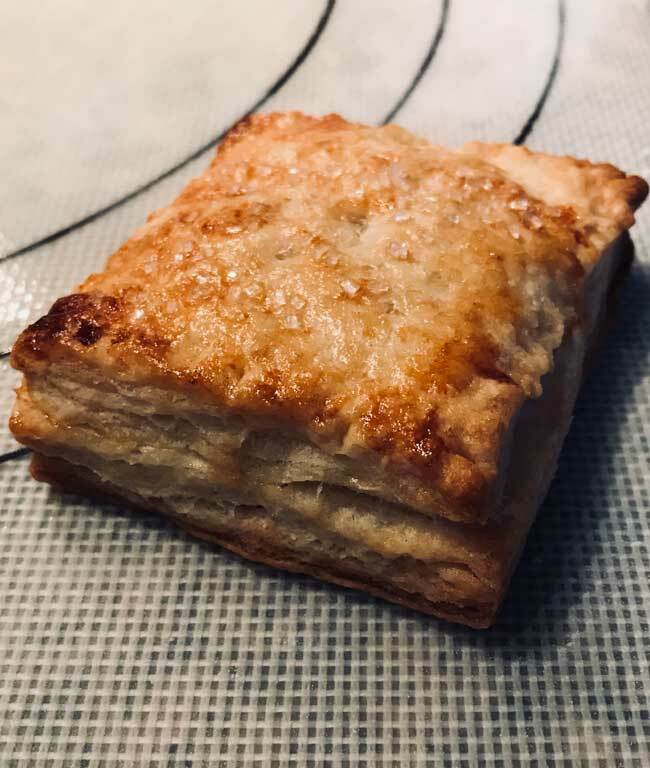 The pastry was very good, but the machine pulverized the butter/flour mixture into tiny bits, whereas by hand I had to work the chunks in more gently. In fact, I still had big chunks of flour when I started the folding process. If you are wondering about the lemon filling, it’s Private Selection California Lemon pie filling, and I found it in the baking aisle at Mariano’s. It looks like jam or preserves at first glance, but it’s not quite as sweet as jam or lemon curd. It comes in cherry flavor too, so guess what? I used some of the dough for cherry flavored pies. So now for the next few weeks when I go rummaging through the freezer I’ll be finding hand pies. Did I mention they freeze well??? Those look so darned good!! Thank you, Mike, for the clarification. Anna, no problem. Enjoy your blog very much, keep it up! Now, to use up the “berried” treasures in my freezer! Procrastibaking or tinnitus control baking. I’ve been focusing my brain on flour, sugar and butter to try to forget about my tinnitus. Its been jumping from running faucet to electric drill sound for two days. Fun! Mike, thanks! You are right. Carol, I apologize if I wasn’t clear enough in the post. I used the same recipe for all versions but used the food processor for the first (blueberry) and did everything by hand for the second (lemon). 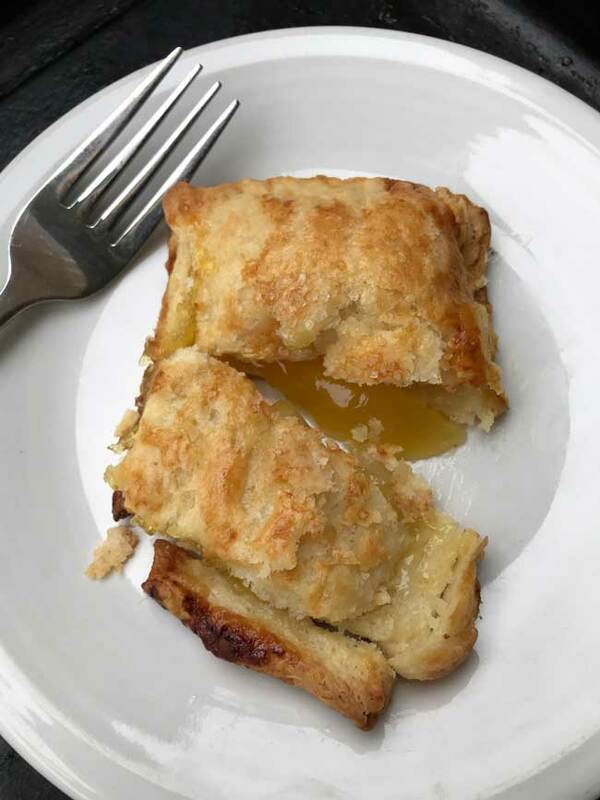 The second version came out extremely flaky and tender – so much so that it looks like puff pastry. To Carol Rosenstock………In reading the post, both dough recipes are one in the same even though the second picture is “lighter and flakier”. It states the method used in making the dough were different (same ingredients). The first pie dough was made in a food processor while the second was made by hand yielding the “puffier” finished pie when baked. Hope this clears things things up. I am a little confused with this Hand Pie Recipe. You give the flour version from King Arthur. The second picture is pastry dough. Do you mean the sheets found in the freezer? Why did you not say how to make the squares using this choice of pastry shell. I am not familiar with how to use the sheets. This post is the very definition of procrastibaking :-).